Largest selection of doors on display. 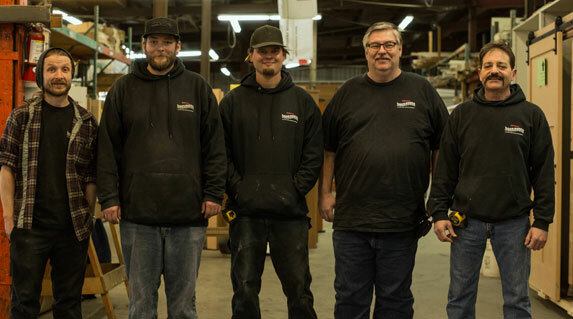 Family-owned and operated since 1917, we are known for providing outstanding selection, value and service to homeowners, builders and contractors throughout the Pacific Northwest. Our warehouse is full of interior and exterior doors to meet any need and any price. We are proud to feature beautiful doors from Simpson, Trimlite, Rogue Valley, Therma-Tru and more. See a sample of what’s available on our Products page. Our outstanding reputation for custom pre-hanging and other door modifications sets us apart. Find out more on our Services page. In the words of a local contractor! One of Seattle's hidden gems. Great customer service and fast turn-around time. Centrally located and super affordable. Not to mention their selection is fantastic. We have worked with Seattle's Doorhouse for more than 15 years. They are quick, flexible, and resourceful in accomplishing whatever it is we need for our door projects. They also have great pricing and a wide selection of quality doors. Thank you for helping to make our projects great over these many years! I have purchased doors for several different homes from Seattle’s Doorhouse. Their crew is always very helpful and informative. They are great at showing me products that match my need without trying to sell me the highest price door. Always trustworthy and fast! Our business can help your business! From high end special order doors to those of my customers on a tighter budget, Seattle’s Doorhouse always has what I need. Dave and the team are the most knowledgeable and helpful in the business. A welcoming place for all knowledge levels! I was truly clueless when it came to doors until I found myself at Seattle’s Doorhouse. Once inside, I was greeted with smiles and offers of help to find that perfect door! Thank you for educating me and not taking advantage of my lack of knowledge!